- Stephen M. Hackett, over at Forkbomber, on why he quit as an Apple retail Lead Mac Genius. His thoughts on the switch to “gadgets” and the hectic repair schedule are fascinating. Posted by davelawrence8 at 7:27 am on June 2nd, 2010. No comments... » Categories: apple. Tags: apple, genius, iphone, ipod, mac, repair, retail. Subscribe via RSS. 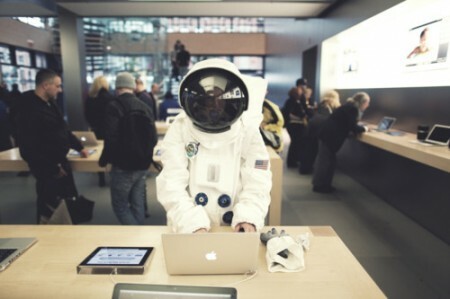 That’s how many people (half of 596,000) bought a Mac at an Apple retail location who have never owned a Mac before. Three hundred thousand people just last quarter, shopping at Apple’s 247 retail locations, who have embraced the Mac way of life. That’s about 2,400 Macs per store, per quarter. Overall, Apple sold 2.6 million Macs this summer. It’s amazing. So many people are switching, Apple is having record-breaking quarters (read the full transcript of today’s quarterly earnings call). That, and with 13 million iPhones in the hands of users – more than 10 million sold this year alone – an increasing number of people are switching to the Apple way of doing things. More Macs, more iPhones (about 7 million last quarter), even more iPods (11 million sold). We don’t yet know how this economic downturn will affect Apple. But we’re armed with the strongest product line in our history, the most talented employees and the best customers in our industry. And $25 billion of cash safely in the bank with zero debt. Who can argue with that? And zero debt? Apple is living the Dave Ramsey lifestyle and they probably don’t even know it yet. Those 300k new users? Let’s embrace them, and welcome them with open arms. Their life is about to get a whole lot more fun. Posted by davelawrence8 at 8:51 pm on October 21st, 2008. No comments... » Categories: apple. Tags: AAPL, apple, financial, iphone, ipod, mac, quarterly, retail, sales, steve jobs. Subscribe via RSS. iPhone 3G at Best Buy this Sunday. The AppleInsider reports that Best Buy will feature the iPhone 3G in this Sunday’s circular, earning a cover shot, even. I had to drive to Ann Arbor, about a half-hour away, to grab my iPhone. But now Jackson will have them, along with a few Macs, at our Best Buy retail location. I might just have to make a trek to the mail and check it out. Posted by davelawrence8 at 6:25 am on September 6th, 2008. No comments... » Categories: ipod/iphone. Tags: 3G, apple, best buy, iphone, jackson, michigan, retail. Subscribe via RSS. 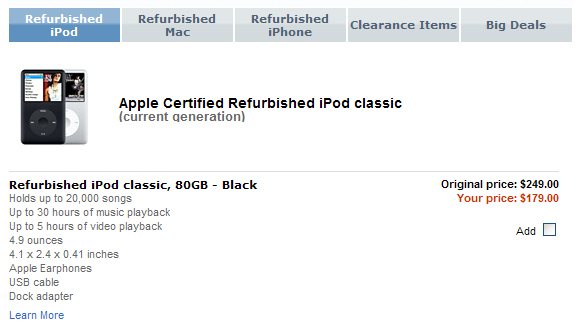 Good news: Apple has dropped refurbished iPod Classic prices on the 80 GB model to $179, down from $199 only a week ago. I’m always scanning the Apple Store’s refurb list for deals, and this one’s a doozy. It makes me wonder: does the price drop signal something? A clearing-out of inventory, perhaps, in anticipation of something on the horizon? iPod Nano refurbs are cheaper these days, too, while iPod Shuffles are stuck at $10 under retail. When Apple dropped the Shuffle prices, the refurbs took a few days to catch up with the new pricing scheme. So what do you think? Is something new coming? Or is this just a fabulous deal? Posted by davelawrence8 at 12:30 pm on August 13th, 2008. No comments... » Categories: ipod/iphone. Tags: apple, classic, deal, ipod, nano, price, refurb, refurbished, retail, sale, shuffle, store. Subscribe via RSS.